A couple of years ago, Allan organised a weekend of rides around the Maryborough area (Allan’s home town). It was most successful. He’s prepared to run another similar event, but as a two-day ride. He’s seeking expressions of interest from Cycling Geelong members and their friends. Allan in front of his grandmother’s house where he spent a lot of time in his youth. 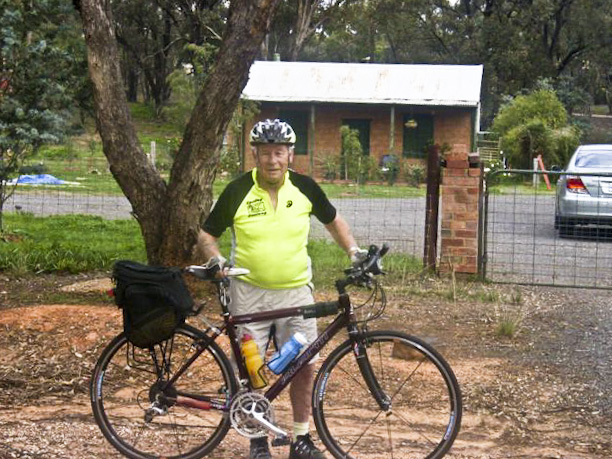 This photo was taken on Allan’s last Cycling Geelong Maryborough tour in 2010. The suggestion is to take the club bike trailer with bikes on the Friday afternoon, with plans for a two day ride starting from Maryborough early on Saturday with an overnight stop at one of the following towns in the Golden Triangle – Newstead, Maldon, Avoca, St Arnaud, Talbot, Clunes etc. The support vehicle/s would carry gear for the overnight stop, before returning to Geelong lat on Sunday afternoon.